In anticipation of the Tulsa Handweavers Guild coming workshop with Robyn Spady I decided to start thinking about a smaller loom that could be transported in the Subaru. The first thing that came to mind was the Baby Wolf but even though it is portable it is not an easy tote. Although an eight shaft would be nice I tend not to go for the complex weaves and felt a 4 shaft would meet most of my needs. Finally, I decided on the new Wolf Pup LT and Donna from the Weavery at Indian Meridian (WIM) snagged me a cherry one. I have named her Wimsey in her honor. 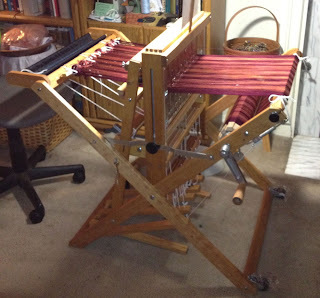 Here she is with the first warp, some hand dyed tencel and rayon purchased at Yarn Barn during an annual trip. 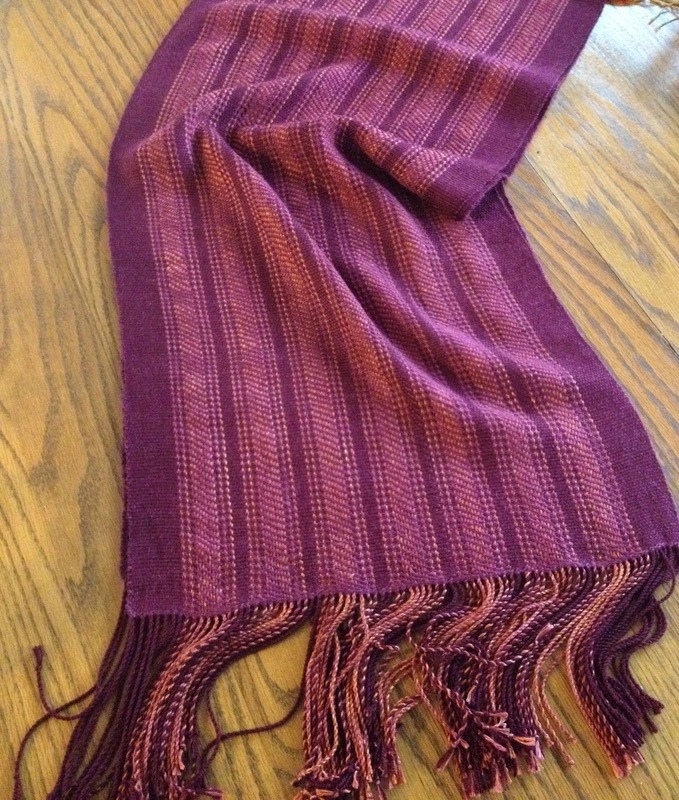 The finished shawl is below, an undulating twill with basket weave crossed with zephyr (wool and silk) weft. Now that Wimsey has been tried and tested I am ready to warp her for the workshop. It is always great to spend a whole weekend with weaving friends, weaving! More about that later.